Thank you so much for considering MercySong Revival for your service, revival meeting, outdoor gathering or any other church function. Please join us in welcoming our new Baritone, Brother Frank Ligon!!! Frank is a veteran of the Gospel Ministry and Gospel Music. We are excited beyond words to have him on our team! Gordon, Brenda, Frank and I have much to be thankful for and Praise the Lord that He has assembled us for such a time as this. Our mission and calling is to encourage Gods people, win the lost and lift the arms of our dear Pastor friends to stay in the battle for the King of Kings and Lord of Lords!! 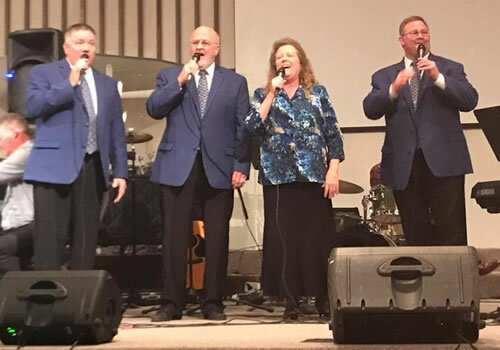 If you want to see more about this dynamic force for gospel music in the area, check out their videos and Tour schedule on their website and on their Facebook page. Contact Kevin Alvis today to schedule MercySong Revival for your next ministry event!